“Now Write! Science Fiction, Fantasy, and Horror” is the fifth volume in the acclaimed Now Write! series of writing guides published by Tarcher/Penguin. “Now Write! Science Fiction, Fantasy and Horror” offers a rare and revealing look at the writing secrets of speculative genre masters like Harlan Ellison®, Piers Anthony, Ramsey Campbell, Jack Ketchum, Aimee Bender, writers of The Twilight Zone, Star Trek: The Next Generation, and many more. “Now Write! Science Fiction, Fantasy and Horror” provides a full toolkit for beginning and experienced speculative genre writers seeking to generate unusual ideas, craft an engaging alternate reality, flesh out enthralling villains, aliens and monsters, or develop a blood-curdling twist ending. 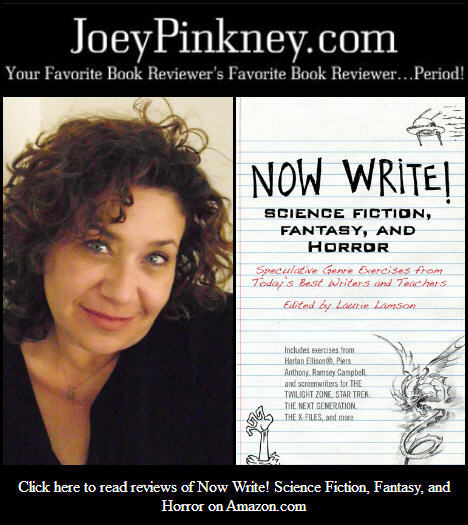 Joey Pinkney: Where did you get the inspiration to write “Now Write! Science Fiction, Fantasy, and Horror”? Laurie Lamson: The “Now Write!” series was started by my aunt, Sherry Ellis, with the first volume, which came out in 2006. While she was working on “Now Write! Nonfiction”, I proposed the idea of a “Now Write!” about screenwriting. She invited me to collaborate and we co-edited “Now Write! Screenwriting“. She was pulling together the exercises for “Now Write! Mysteries” when she passed away in March 2011, and I stepped in to complete that book. Tarcher/Penguin then asked if I would do another “Now Write!” by myself. They liked the idea of a volume about speculative genre writing, so I decided to take on the challenge. JP: What sets “Now Write! Science Fiction, Fantasy, and Horror” apart from other books in the same genre? LL: There are many books about creative writing, novel writing, screenwriting, and quite a few writing exercise / prompt books, but very few about genre writing, especially about the speculative genres. Most of the writing books I found by science fiction, fantasy and horror masters like Ursula LeGuin and Stephen King are about writing in general rather than about their own genre. To my knowledge, “Now Write! Science Fiction, Fantasy, and Horror” is the only book that provides a variety of insights and exercises specifically about writing in these genres. JP: As an author, what are the keys to your success that led to “Now Write! Science Fiction, Fantasy, and Horror” getting out to the public? LL: I was lucky my aunt created a legacy and a high standard with the first two Now Write! books, and kindly asked me to collaborate on the third book in the series. I was the logical person to complete the fourth book, and the publisher invited me to do the fifth book. So I stepped into a situation with an agent and publisher already in place, as well as an editing approach that I had already experienced. JP: As an author, what is your writing process? How long did it take you to start and finish “Now Write! Science Fiction, Fantasy, and Horror”? LL: I’m more of a screenwriter / scriptwriter than a book author (though I do have a self-published magic realism book – “Witch Littles: Magic in the Garden“). I did very little writing on this book. My job as editor was to identify and invite hundreds of potential contributors, provide them guidelines and receive contributions from those who were interested in participating. I lightly edited their pieces if it seemed necessary, and then organized them into chapters and wrote a book proposal. I also went through two rounds of editing/proofing with the publisher. JP: What’s next for Laurie Lamson? LL: I just co-wrote and directed a short romance film, Eternal Waltz, and I start the syncing and editing this week. Have a few books to edit for clients and a detailed outline of one of my own projects is ready, so I’m looking forward to taking it to screenplay version as soon as I get a chance. Lots on my plate! I will be in NYC for a talk with “Now Write! Science Fiction, Fantasy, and Horror” contributor Jack Ketchum on April 15, 7pm at the Center for Fiction in NYC.